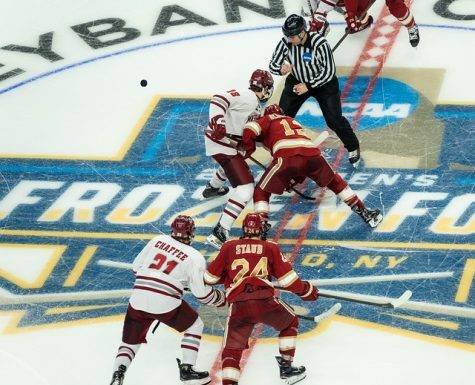 Offense has been hard to come by for the Massachusetts hockey team this season. 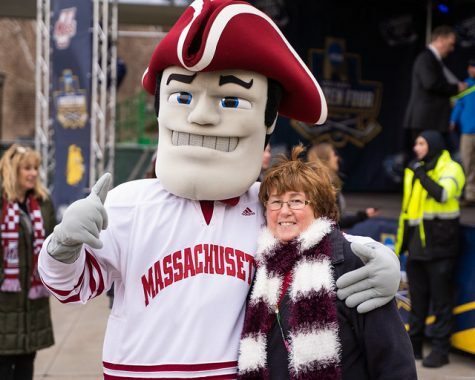 The Minutemen are only averaging 2.04 goals per game, which puts them in second-to-last place in Hockey East. 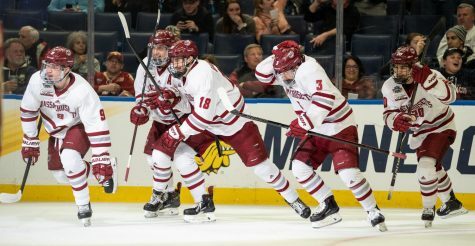 But the good news for UMass (6-15-3, 2-7-2 HEA) is that this weekend they face the only team that is averaging less goals per game than they are: Merrimack. 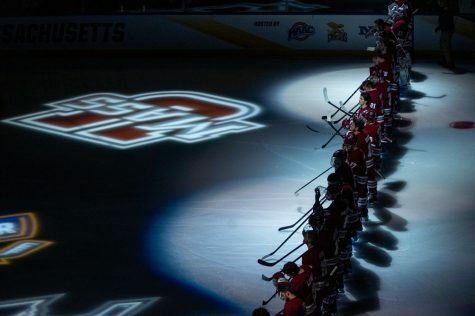 The Warriors, at 1.95, are the only team scoring less than two goals per game this year in Hockey East. So expect an offensive struggle when these two teams face off in a home and home series this weekend. “We got to make the ice bigger,” Minutemen coach John Micheletto said when asked what his team needs to do on offense this weekend. “Their game is about shrinking the ice. They’re very effective at it at home, and we’re hoping to exploit that Friday night first and foremost, and the bigger sheet and forcing them to defend more ice. “But that means we’ve got to move pucks through the neutral, and got to pull pucks off the wall in the offensive zone,” he continued. But there is a bit of good news for both teams on offense. 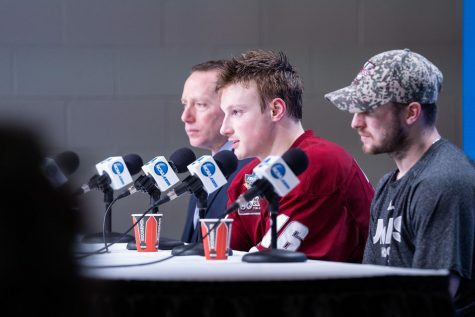 UMass decided to switch up their line pairings since they were previously stuck at averaging two goals per game, a mark that is hard to win with in hockey. Micheletto moved Steven Iacobellis up to the first line with Conor Sheary and Branden Gracel, and moved Michael Pereira to the second line alongside Troy Power and Ray Pigozzi. 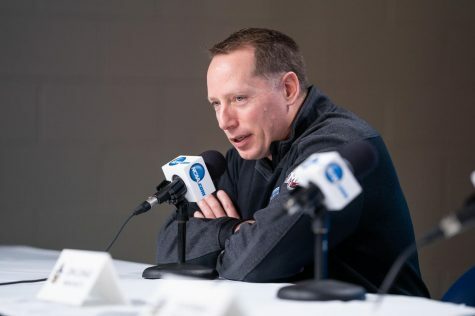 Pigozzi has been out for the past two games against the U.S. Under-18 squad and AIC, so his spot on the new second line was filled by Adam Phillips in the loss against the Yellow Jackets. 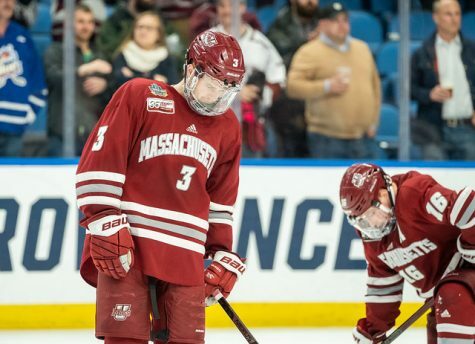 Since the move, the Minutemen have averaged 3.33 goals per game, a better mark offensively, but the results haven’t been there in non-exhibition games. 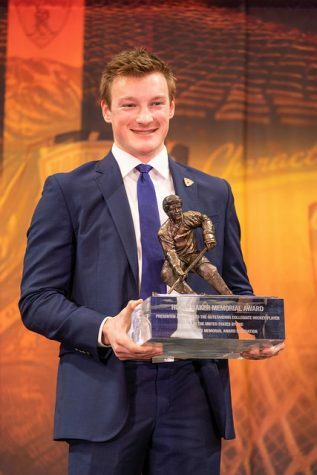 And as for the Warriors (6-12-3, 1-6-2 HEA), they were aided by the return of sophomore forward Brian Christie, who has played in the last 10 games after missing the majority of the first month and a half. Despite all of the time that he missed, Christie is second on the team with 11 points. 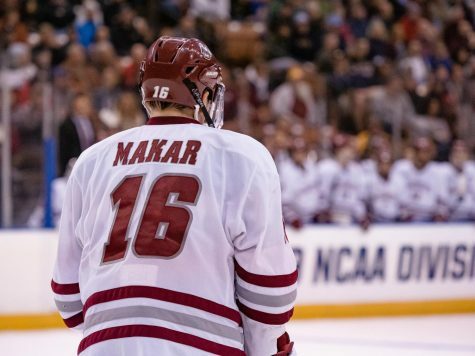 His best game came against Quinnipiac on Jan. 18 when he scored two goals and added on an assist in his team’s biggest win of the season, a 6-3 win over the then-No. 5 Bobcats. Micheletto believes that his return was a big boost for Merrimack and has helped its offense improve as of late. This weekend is a crucial slate of games for both teams, as they are both trying to steer clear of the Hockey East cellar. The Warriors have the lowest point total at the moment with four, but that total is only two points behind UMass. So with the middle and the bottom of the conference separated by only a few points, each game down the stretch has a valuable two points up for grabs. Friday’s game is scheduled to start at 7 p.m. at Mullins Center. Saturday’s contest is also scheduled to start at 7 p.m. in North Andover and can be watched on Fox College Sports.